If you are looking for all-rounder for gardening work, this is where to find it. 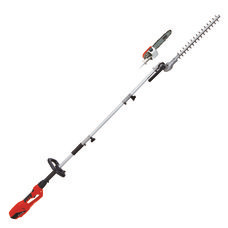 The multifunction tool from Einhell combines a hedge trimmer and pole-operated pruner in one. 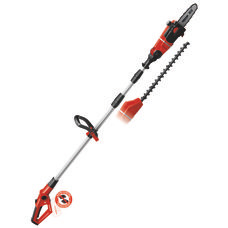 Our cordless multifunction tool is equipped with a lockable telescopic handle and enables high branches to be pruned and hedges to be trimmed effortlessly from ground level. Thanks to the 90° swivel attachment it is no difficulty making horizontal cuts either. Being cordless, it allows the freedom of movement you need. Changing from the hedge trimmer to pruner is no difficulty, anytime.